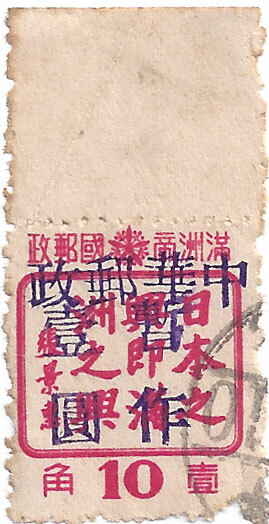 This is a hard blue/purple surcharge The top four characters read 中國郵政 Chinese Post, right 暫用Temporary Use, left the surcharge. 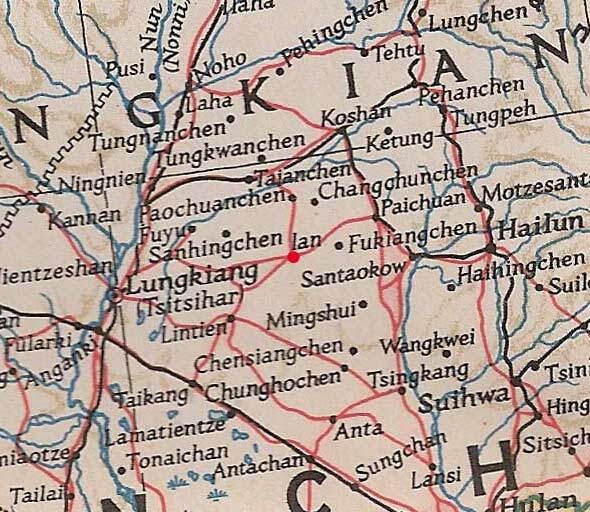 Kerr lists this under I An but states that it has been moved to Tai An. 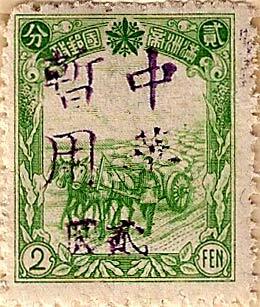 Chan still list these stamps as I An and from covers I have seen I An looks to be the most likely source. 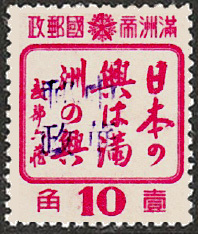 Unused copies are unknown and all copies are scarce. 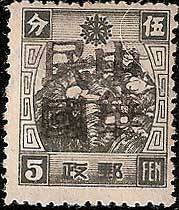 This is a four soft black character overprint reading 中華民國 Chinese Republic. This is a complete set. 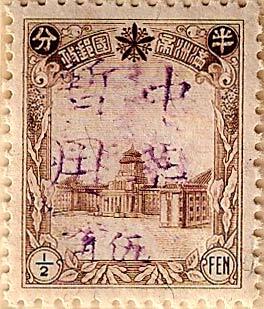 This is a four character, soft violet overprint reading 中華郵政 Chinese Post. 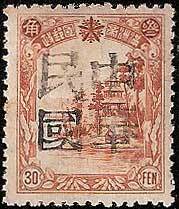 Kerr reports no un-postmarked stamps known for this overprint -, above is a complete set. 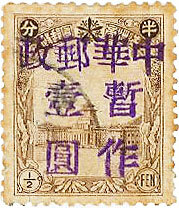 Chan also shows a photograph of an unused stamp. 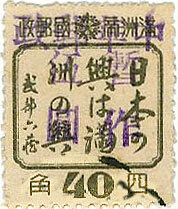 The top four very soft violet characters read 中華 China, 暫用 Temporary Use, below these is the surcharge. This is a complete set. 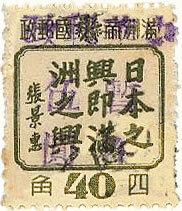 This is a four character, hard violet overprint reading 中華郵政 Chinese Post. 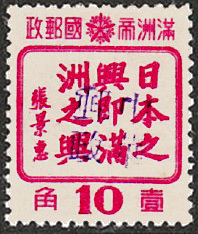 The surcharge reads 1Y 作妀 Revalued. 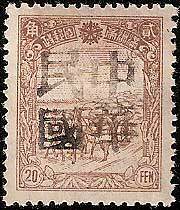 These 10f stamps represent the complete sets. 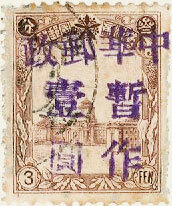 These are rare and only known to Kerr on covers. 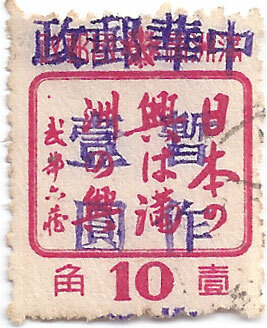 He only lists the soft 1Y surcharges. 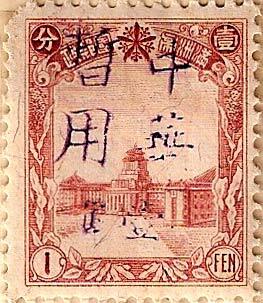 Chan lists a chop based on Kerr's sketch, the actual stamps are quite different as shown above. 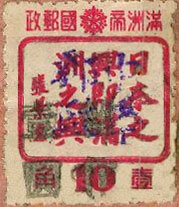 Examples of all stamps know for this town are shown above.